Having a business related to quilting is nothing new. Women have likely made or finished quilts to earn income ever since quilts became a desirable bedcovering. During the late 1800s and into the 1900s women marked items for redwork embroidery as a home business. Others hand quilted for those who preferred not doing their own quilting. Sometimes a barter system was used, for example a woman might buy enough fabric for two quilts. 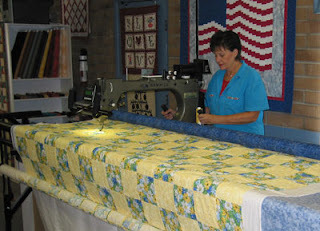 The quiltmaker would then make them giving one to the person providing the fabric and keeping the other to sell or use. 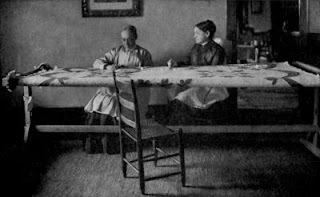 When the Great Depression descended on the world women who were skilled quilters made and quilted quilts either to sell on their own or as employees of a larger business. The Secret They Could Never Tell is an interesting example of this. Today women are doing everything from making quilts to designing patterns and fabric as a business. Others are teaching quilting classes, some even online. There are many women owned quilt shops both online and off. And of course there is the uniquely modern business of doing long arm quilting for quilt makers who don’t want to do their own quilting. My personal plan on this is if my quilt is twin bed sized or bigger off it goes to the long arm quilter. The next interview is another women who has her own quilt business. It is one of art quilting. Read all about it at Rose Hughes On Becoming a Quilt Artist.